My daughter is so happy over her mermaid blanket, that I made another smaller one, to fit a 5 year old sweet little girl. 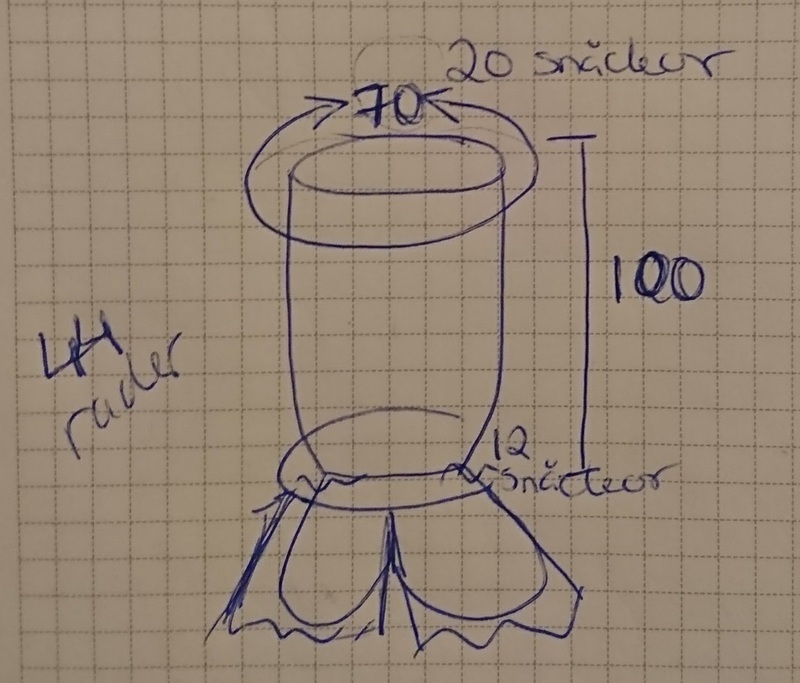 The pattern is almost the same, but I made the opening longer, so it will be easier to get in and out of the tube. She can either hold it up over her whole body, or fold the top down if she wants to have her hands free to read a book. 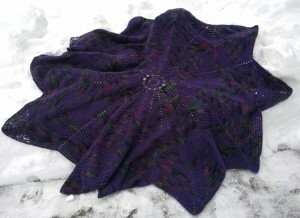 I made the fen smaller, so the blanket wouldn't get too heavy..
Close up of the shell pattern. The back. I could have left an even longer opening. My drawing used as pattern. 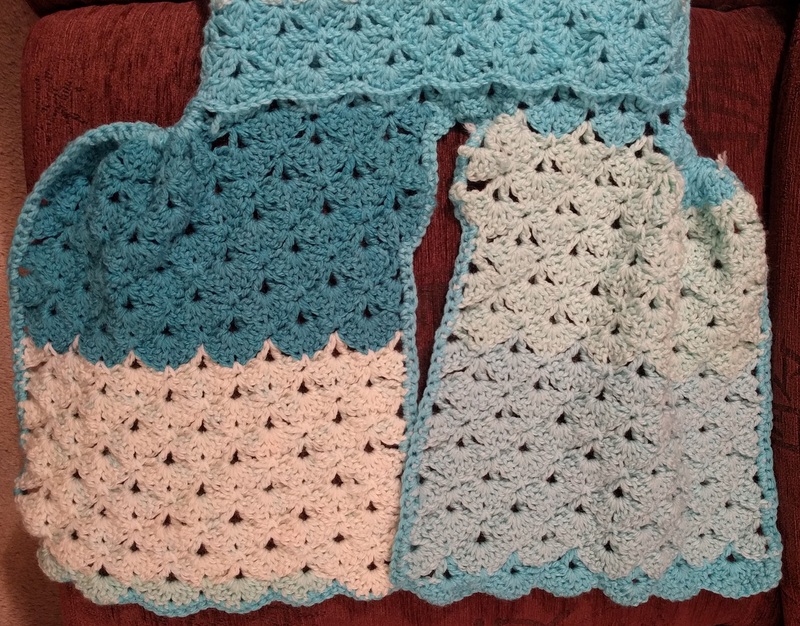 I measuerd the first mermaid blanket I made for my daughter and made a smaller version of it. Crochet a tube: Like a sleeping sack. 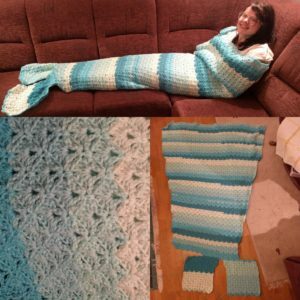 There are also models of mermaid blankets that are like an ordinary blanket and just a pocket to put your feet into. My daughter wanted something that really embraced her, so I made almost like a sleeping sack. Crochet something that looks like a fish tail. 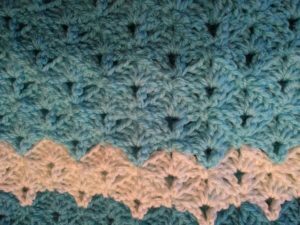 Use crochet stitches that give a wavy impression, i.e. impression of fish skin. 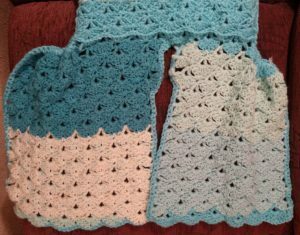 Make it long enough to cover the shoulders, because you will be able to really cuddle up in this a cold winter evening. If you want it shorter, just fold the top. 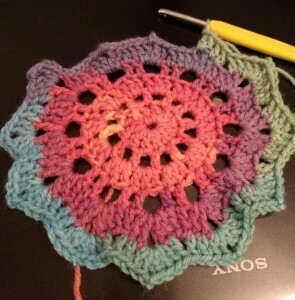 The yarn is Caron Cakes int he colour Faerie Cake from Michael's and crochet hook 6.0 mm. I used 5 cakes (=1000 gr or 1750 meters). The yarn is soft and easy to work with. The colour is absolutely beautiful in real life and I do like the each colour is long enough to make a stripey impression instead of the often very busy patterns that plenty of variegated yarns have. 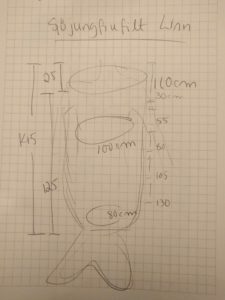 This is the sketch I draw and used as a pattern. This is how the whole piece looked before I have sewn them together. I left an opening from the waist and up, so it would be easier to take in on/off. Close up at the fish tail. I have noticed other people making them up from side-to-side instead, but my idea was that the fens shouldn't be to heavy. 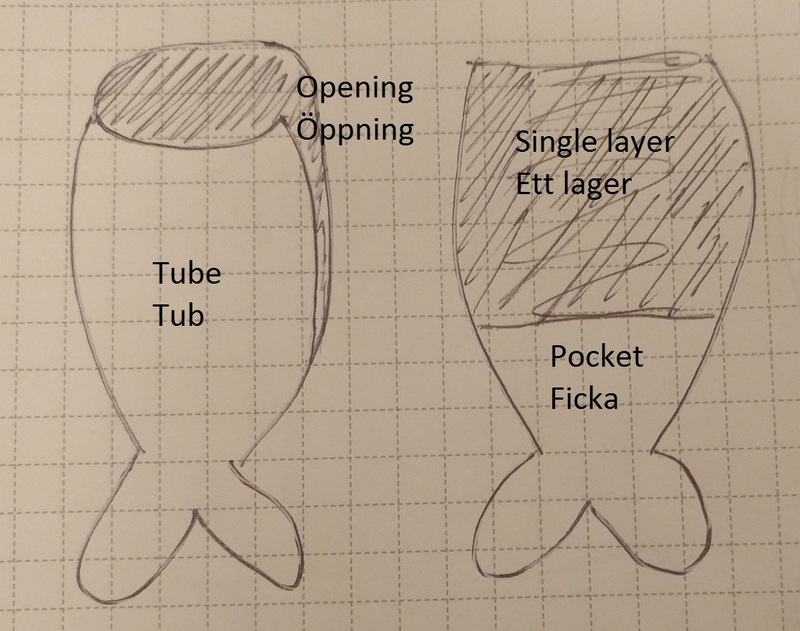 I just continued with the same pattern and tried to shape them to somtehing fish-like. 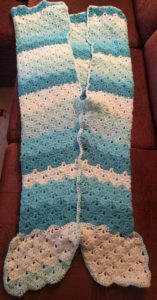 The stitches are a shell pattern which gives that waterly fishlike impression which is emphasized by the sea coloured yarn. Either you make a tube and leave an openingen at the top. Or you make a blanket and add a fish tail and a pocket for the feet. 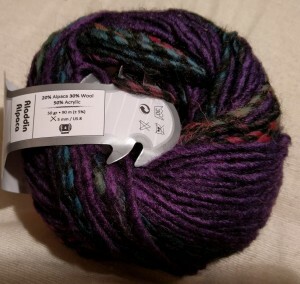 I brought home the Caron Cakes yarn from the States, but I do hope I will be able to get som for a reasonable prices here at home too (Sweden). I can only express my jealousy for the amazing crafts shops I visited in Pennsylvania (beautiful friendly Manheim - Lancaster - State College). So much to choose from and reasonable prices. Large affordable skeins of yarns and not those tiny little skeins you get here. It was a crafter's fulfilled dream to shop there. 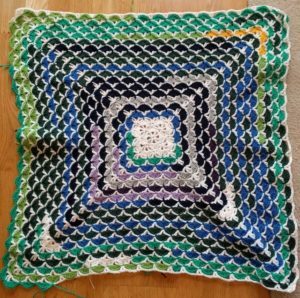 This is my temperature blanket for 2016. The blanket has one colour representing onespan of temperature. 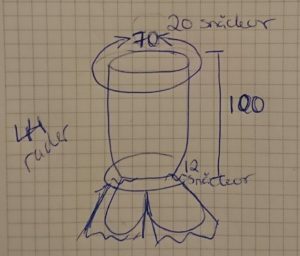 Every group of 6 shells represents one day - going from the middle and out in rounds. Blue is minus (Celsius) degrees and green is just above zero. Yellow/red is Summer temperatures. It's quite obvious the the first part of the year is the coldest time, then the Summer comes. The Autumn has a couple of cold days, but most of the time it's just above zero. The white parts mark a new month. A temperature blanket is a blanket where every part reflects the daily temperature. Everyone makes his/her own plan for what colours to use for which temperature. After that: It's just to check what the temperature is outside and crochet the chosen colour. You can do a blanket that shows the actual year's temperature, the temperature the year your child was born or the first year of your marriage. There are also people doing "mood blankets", where the squares or stripes represents how you feel. I've also seen "rain blankets" for rainy places. Some people add special colours for storm, earthquakes, snow, snowstorms etc. If you think that making a blanket is far too much work: Make something smaller instead like a scarf. Or do something that reflects the average temperature for a month, than you only have to make 12 different parts to join. I use the yarn Fuga from Järbo which is affordable and easy to get where I live. It hopefully lasts longer than a pure acrylic yarn after daily use. Choose a yarn that you can buy as you go, since it's hard to calculate the exact amount of yarn needed for each colour. I chose to use blue shades for sub-zero temperatures (in Celsius), green for above zero and red for the Summer temperatures. The total amount of yarn used was approximately 1,2 kg yarn, i.e. 24 skeins about 2900 meters. I live in Sweden so got the temperature from our national service: SHMI.Se. The also have historical data Excel-format to download. Your country problably have the same national service. 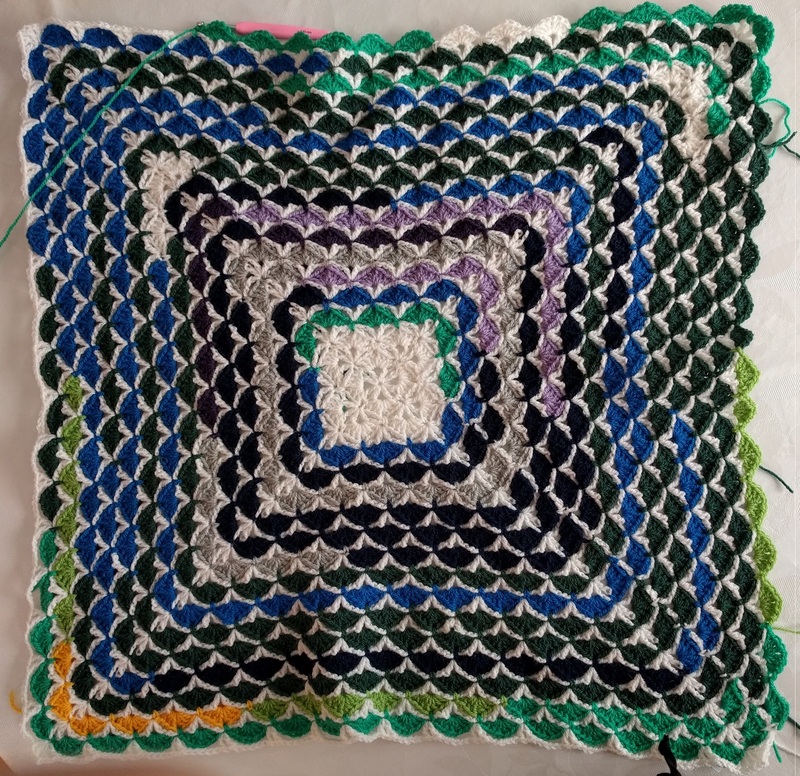 The pattern of a temperature blanket may vary: You can make a square per day (granny square are often used), combine several days into one larger square, one square per month or 1 stripe per day. 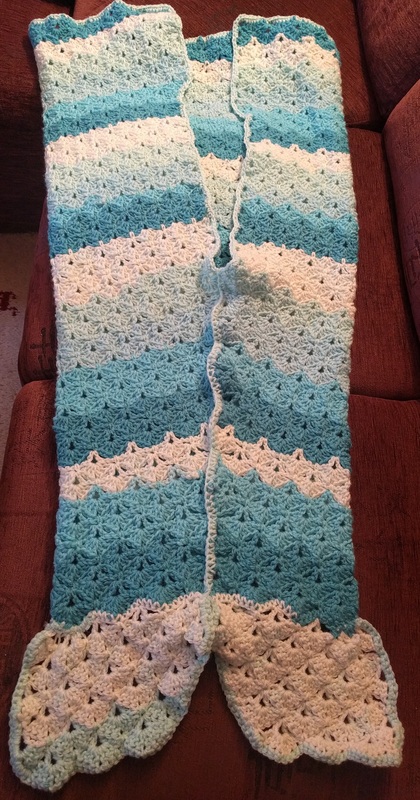 It's important though that you estimate how large your blanket will be when you're finished. It's not fun to realise that your stripey blanket will end up 3 meter long. 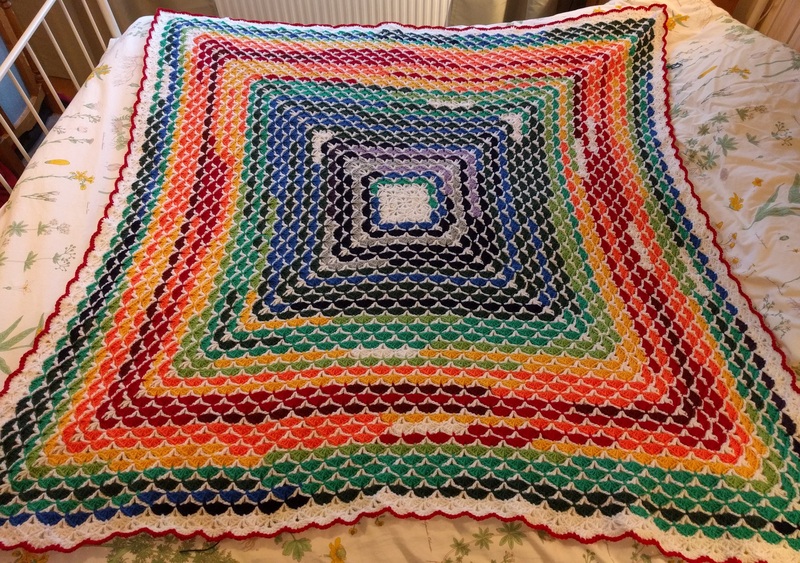 It's as sad as when your blanket made from granny squares is 3,5 meter long. 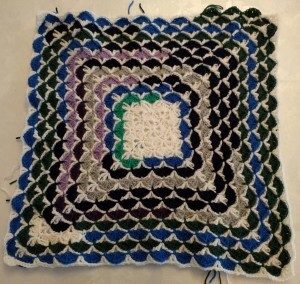 If you want to make a blanket from squares (granny square on any other square) 380 squares (= 19*20 rutor) will give you 14/15 extra squares to fill in and use for showing where a new month starts. I you want a 180 cm long blanket each sqaure should be 9 cm. 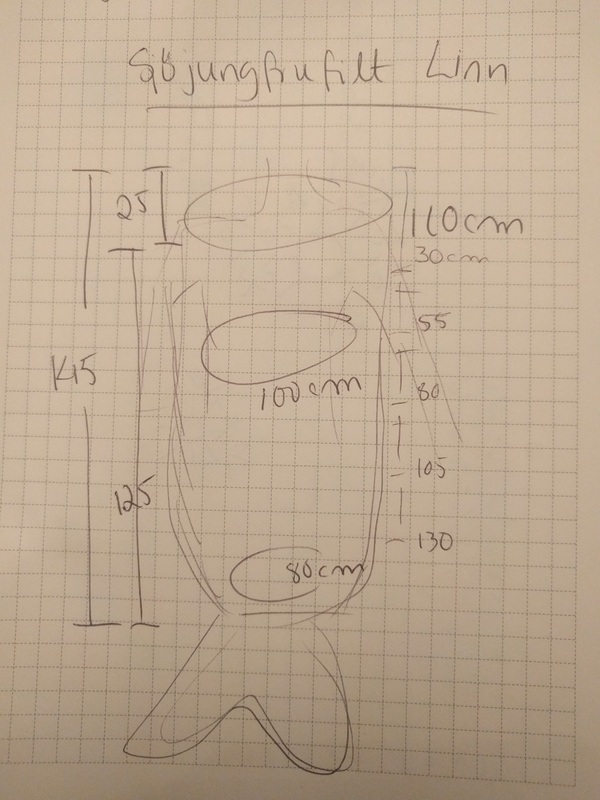 This is my plan how to place the squares into 20 * 19 rows. To get a view of how the colours would distribute I used old weather data to make a model. I used the max temperature for each day during 2014 and made a simplified layout. 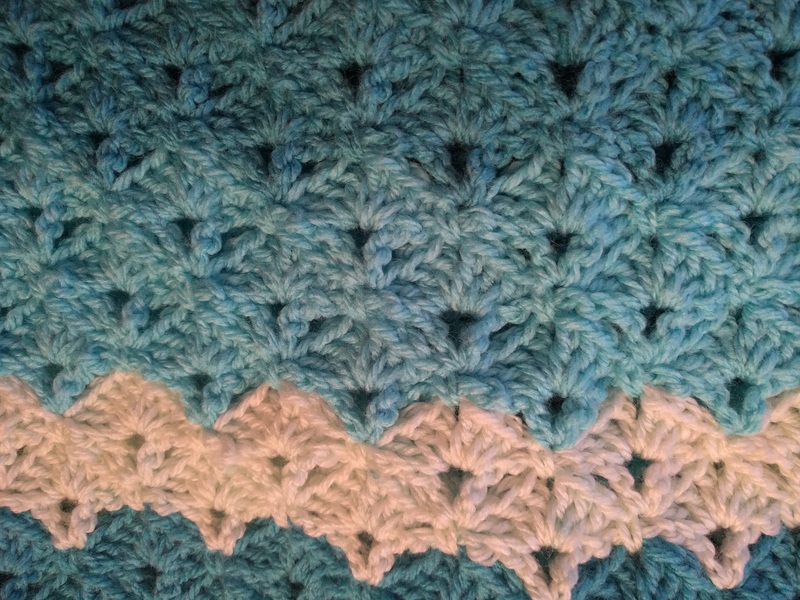 I'm totally in love with this shell pattern and my plan is to make a blanket using this pattern. 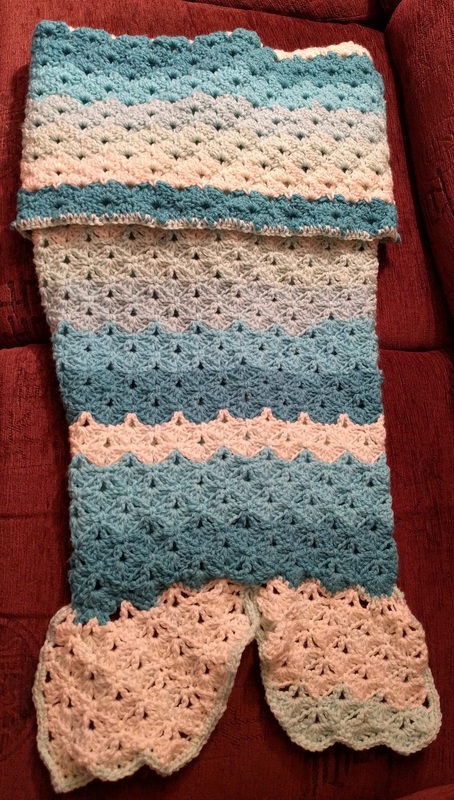 I calculated how many shells I would crochet each row and measured the height of one row. The first row is 12 shells. Every row adds 4 shells. After 31 rows I have totally 2232 shells. 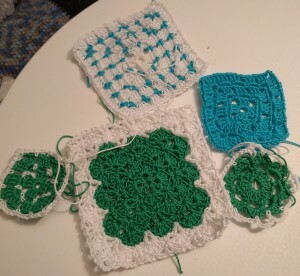 If the year is 366 days, I can crochet 6 shell/dag and have 36 shells to use a month dividers (3 shells for each month). And yes, of course I have an Excel-sheet for this. 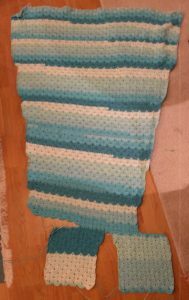 I realize that the blanket may be on the smaller side (110 cm long), but I can make a border in solid white if I want to make it larger. Now all the fun starts to find out what the max temperature is every day and then crochet 6 shells of the right colour. New month is 3 white shells. If I don't want to wait for the days to pass I use the numbers from 2014. Here I have marked which days that are made. This is an example of my creative pre-process before deciding exactly what pattern to use. This is a suprise blanket for one of my BFF. She's not having a birthday or anything. I just felt that she needed a heavy warming blanket to use during cold winter evenings. 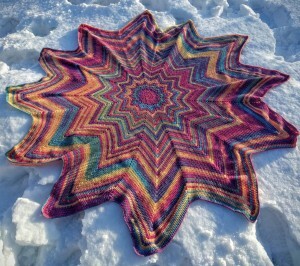 I made yet another star blanket and the yarn is: Aladdin Alpaca Purple Green Shades Fuchsia ( 20% Alpaca, 30% Wool, 50% Acrylic andd 90 m/ 50 gr). Crochet hook is 6.0 mm. I used 31 skeins (=2790 m). The feeling of the finished blanket is really luxurious and the yarn has a nice luster to it. However, I do think it was a somehow difficult yarn to work with, but I guess that the really lovely result makes it worth the effort. 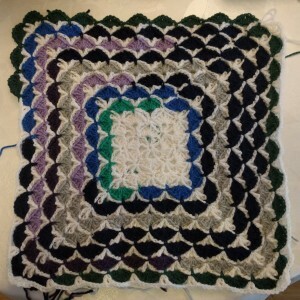 The pattern is Bernat Mosaic Afghan. 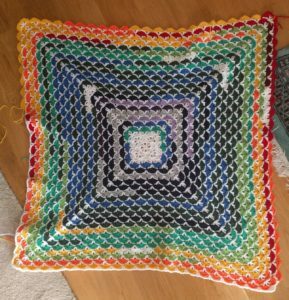 There are other patterns out there for star afhgans and you can usually make them as large as you want to. This star has 12 points, which gives a nice volume to the afghans. 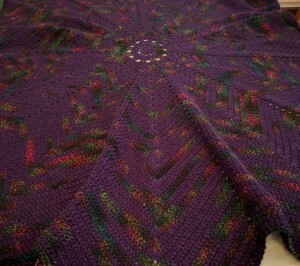 The yarn is self striping but with the purple is really dominant which gives a nice spotty effect. Really nice. 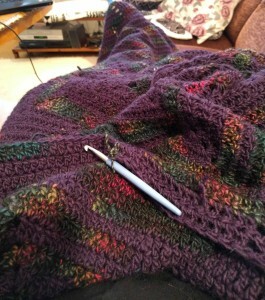 The blanket is 2 meters point to point and it was nice and warm to put it over my legs while crocheting the last rows. My first afghan is ready. I decided to make it shaped like a star. The yarn I use is Magic Light Yellow Purple Pink Green Blue and crochet hook 5.0 mm. I used 8 skeins (=2880 m). 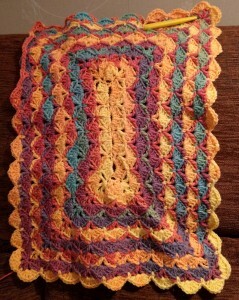 The pattern is named Bernat Mosaic Afghan. 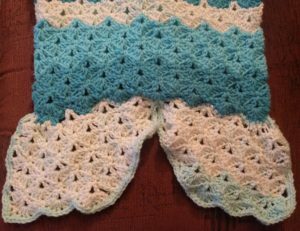 The pattern has a minor error in it, but you can use any pattern for a star shaped blanket and make it any size - there are plenty of them out there. I'm very fond of these self-striping / variegated yarns, but I do think they are best used in simple patterns made up from dc. 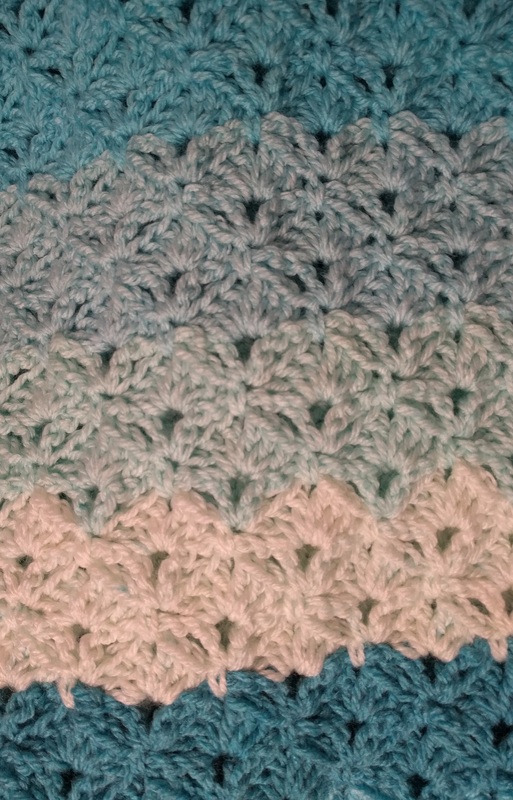 I started to make a shell blanket in the same yarn, which didn't turn out well at all. 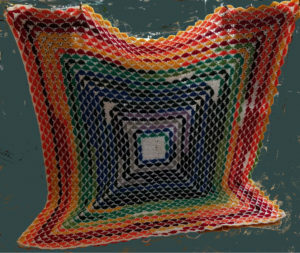 It looked as if I had made major errors, while the visual effect was all from the colour changes of the yarn. While I was working with the afghan it felt huge! It's almost 2 meter long from point to point. When I started to use it, I sort of regretted that I hadn't made it even bigger. My first large fail with the same yarn. I frogged it.